This is a supplement formulated with green coffee bean extract and designed to support weight loss, optimum metabolic function, and liver function. In each bottle are 60 vegetarian capsules with 50% chlorogenic acid, the primary active ingredient that supports weight loss. Nature’s Way operates under several levels of certification from various quality-assurance agencies and claims to be the first company in the USA to be certified as an organic processor. The vegetarian capsules contain no artificial colorings or flavorings, corn, diary products, gluten, preservatives, salt, soy products, sugar, wheat, or yeast, but do contain cellulose, silica, and magnesium stearate. 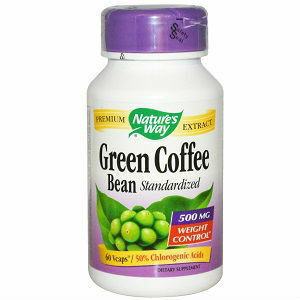 In each capsule is 500mg of green coffee bean extract with 50% chlorogenic acid, an equivalent of 250mg. This formula contains less than 2% caffeine, which is equal to about 10mg, or less than a quarter cup of brewed coffee. Chlorogenic acid is the primary driver of weight loss in green coffee bean extract and is also a powerful antioxidant that supports the liver and has been shown to lower blood pressure. This product is non-GMO verified, and certified with Tru-Id, as well as several other quality assurances. Nature’s Way suggests taking one capsule twice per day, but does not mention when these should be taken, and whether or not they should be taken with food or water. Other similar products recommend taking one tablet 30 minutes before mealtimes, and with a full glass of water. It is not recommended that women who are pregnant or breastfeeding, or anyone under the age of 18, take this product. If you are taking any medications, or are suffering from any long-term health problems or concerns, be sure to consult with your doctor or healthcare provider before taking this supplement. The low amount of caffeine in this supplement minimizes many of the adverse effects, but those who are especially sensitive to caffeine may still want to avoid this product. Some of the ingredients in the capsule, including cellulose and magnesium stearate, have been known to cause upset stomach and nausea in users with a history of stomach issues and sensitivity. This product is available through a number of online pharmacies including Amazon, Drugstoer.com, The Vitamin Shoppe, Wellica, and others. It is also available through specialty health stores locally, with a store locator on the company’s website. The lowest price we found was $15.40 through Amazon, with others around $17.00. We were unable to find any information on the manufacturer’s website about product guarantees, beyond assurances of quality. It is possible that there may be return policies through purchases made in-store or through third-party sites, but this is not clear. Reviews for this product are about 75% positive. This product appears to be formulated to high standards and is free of GMO ingredients and a number of allergens. The low amount of caffeine makes this product a good choice for those with mild caffeine sensitivity compared to other similar products, and the price point is competitive. However, the lack of a product guarantee and the sizeable number of unsatisfactory reviews indicate that this product may not be wholly effective at stimulating weight loss. Edward Tobias	reviewed Nature's Way Green Coffee Bean	on December 13th	 and gave it a rating of 3.